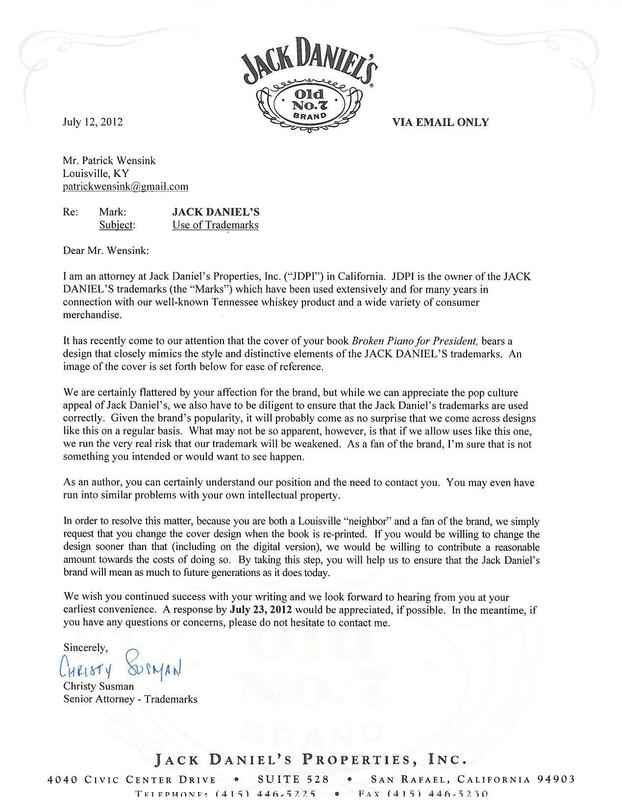 “We are certainly flattered by your affection for the brand, but while we can appreciate the pop culture appeal of Jack Daniel’s, we also have to be diligent to ensure that the Jack Daniel’s trademarks are used correctly. Given the brands popularity, it will probably come as no surprise that we come across designs like this on a regular basis. What may not be so apparent, however, is that if we allow uses like this one, we run the very real risk that our trademark will be weakened. As a fan of the brand, I’m sure that is not something you intended or would want to see happen. The letter then goes on to ask that Wesnick change the cover of his book on subsequent reprints, and even offers to contribute to the cost of doing so (Wesnick and his publisher, Lazy Fascist Press, have agreed to do so but refused the offer to contribute funds). Wesnick’s also posted a copy of the full cease and desist letter to his website, and it’s truly worth reading as an example of internet diplomacy handled well. The story has already been picked up by Mashable, where we first came across it, and looks to be generating positive results for both Jack Daniels and the author in question. Positive though the outcomes may be, this story can also serve as an object lesson for writers getting involved in the design process. There’s certainly an increasing number of designers offering cover design services listing in the Australian Writer’s Marketplace, and the hows and whys of establishing an ebook cover are a recurring question among writers interested in self-publishing. In the past writer’s have been free to ignore design altogether, leaving it up to their publisher to determine a books look and feel. Now, as more authors opt for independent publishing routes, it’s a smart move for any new writer to have at least a passing understanding of effective design. We recommend checking out 10 Tips for Effective Book Covers that covers the basic mistakes, and one of our favourite resources for understanding ebook cover design is the monthly eBook Cover Design Awards over at thebookdesigner.com. Every months the awards display the winners, runners up, and other submissions along with some commentary from the judges about what works, and what doesn’t. Beyond that? Writers and ebook designers need to learn the importance of a design that looks good when reduced to thumbnail size to ensure the book isn’t lost in digital marketplaces, know where to source art and how to create a unified look for their work, and the importance of contrast and colour in the design. Even if you’re not planning on designing the cover yourself, it’s worth getting a grounding in the basics to ensure you getting what you need when paying a professional. We’ve touched on some of the great advice out there, but there’s bound to be more. What book covers really tickle your fancy? What cover tips have you come across? Any hard-earned lessons you’d care to share?